Clinic hours: 8 a.m. to 8 p.m. Mondat to Friday; saturday 9 a.m. to 3 p.m. Welcome to Holsman Children's Therapy Center at Fair Lawn, NJ. The Fair Lawn, NJ location of Holsman Children's Therapy Center, LLC is distinguished for its comprehensive and effective range of Pediatric Physical therapy, Occupational therapy, Speech therapy, and Applied Behavioral Intervention Treatment (ABA Therapy). We offer personalized care and state-of-the-art rehabilitation and sensory gym equipment in a welcoming and caring environment in our open space Sensory Gym. Other services offered are Yoga, Tai Chi, Sensory Martial Arts, and Social Skills Training. We accept most major insurances and private pay. We serve patients and clients in the surrounding towns of Fair Lawn, Elmwood Park, Paramus,Glen Rock, Hawthorne, River Edge and Rochelle Park, NJ. Physical Therapists at Holsman Children's Therapy Center look at all areas of gross motor development in children to determine any areas of concern. They provide treatment and support to develop and improve your child’s motor planning, balance, and coordination skills. Our Therapists are experienced in treating patients with Autism, ADHD, Sensory Processing Disorders, Cerebral Palsy and Developmental Delays. Occupational therapists at Holsman Children's Therapy Center in Fair Lawn, NJ help children to achieve their full potential and reach their developmental milestones. They evaluate, measure, and improve child’s fine and visual motor, perceptual and sensory processing, and self-care skills. These skills are essential to perform their activities of daily living (ADL) such as dressing, feeding, grooming, bathing and other daily tasks. Occupational therapists find creative and interesting ways to encourage your child to participate in the therapeutic learning process. The Occupational Therapists at Holsman Children's Therapy Center are experienced in treating children with Autism Spectrum Disorder (ASD), ADHD, Sensory Processing Disorders, Cerebra Palsy and Developmental Delays. Speech-language therapists focus on all areas of communication development in children. That includes but is not limited to speech articulation, fluency, voice projection, receptive and expressive language disorders, social communication, cognitive-communication, and swallowing disorders to determine an evidence-based treatment plan. Speech Therapists at Holsman Children's Therapy Center use standardized tools to evaluate and measure your child’s level of speech and language development and tailor personalized treatment plans according to the assessment results. Holsman Children's Therapy Center in New Jersey provides occupational, physical, and speech therapy services for children. 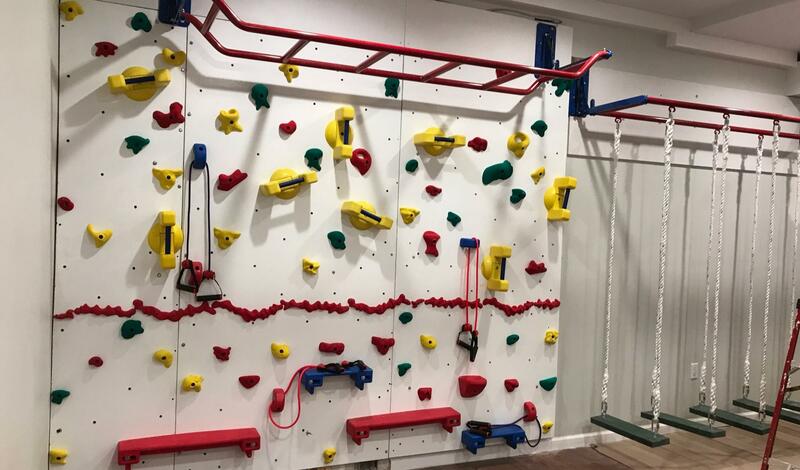 Our unique sensory gym provides opportunity for your children to explore, discover, and experience with various sensory inputs activities within a safe and encouraging environment. All our fun and creative activities are directed by licensed therapists who are passionate and dedicated to help your children to master their skills for a smooth transition from home setting into school setting. Applied behavior analysis uses principles such as positive reinforcement, to bring about meaningful and positive change in children’s behavior. It will allow the child to practice and express themselves with appropriate behaviors in structured situations such as on the playground, family dinner time or in the classroom. We accept most insurance and private pay. We will call your insurance company for you, to verify benefits as well as send the claims to the insurance company in your behalf.